The authorities plan to relax restrictions governing visas for Muslim pilgrims, meaning those travelling to Mecca and Medina will be able to extend their stay and visit non-religious cultural cities and sites. The tourism industry currently generates about 2.7% of Saudi Arabia's Gross Domestic Product (GDP), with religious tourists making up the largest group of visitors to the kingdom. 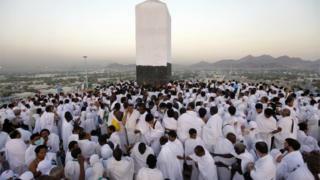 The Hajj pilgrimage, which takes place in the 12th month of the Islamic lunar calendar, and lesser Umrah pilgrimages, which can be performed at any time of the year, contribute $12bn annually. That is projected to rise to more than $20bn within the next four years, according to the Council for Economic and Development Affairs. The council predicts that the number of religious tourists coming to perform Umrah will grow from eight million this year to 15 million by 2020, and 30 million by 2030. Until now, pilgrimage visas tightly controlled where and when pilgrims can travel in Saudi Arabia, but officials hope to loosen these restrictions. "We're working towards pilgrims visiting Saudi antiquities, such as Madain Saleh near Medina, after they have done their religious duties," said Prince Sultan bin Salman, head of the Saudi Commission for Tourism and Heritage. "But we also have attractions that will encourage tourists to travel much further and to visit other parts of the kingdom." A vast programme of infrastructure development - including railways linking Mecca, Medina, Jeddah and other large urban centres - is already under way. Among tourism attractions being prepared are archaeological excavations, including spectacular rock art, that will become open-air museums. Oxford University professor Michael Petraglia, who heads a team of archaeologists in Saudi Arabia, says there are dozens of such sites - including Jubbah, Shuwaymis and Nejran - which could draw large numbers of visitors. "There are four Unesco [World Heritage] sites in Saudi Arabia and many others are under consideration," he said. Mohammed Hafez, a member of the influential Saudi Art Council, said cultural initiatives had untapped potential to boost the economy. "Our basic aim of educating Saudi Arabians about art has been eclipsed by events. "Now art plays a part in every project - from Jeddah's new international airport to building tourist programmes around the unique collection of international modern sculpture on Jeddah's corniche," he said. A recently-announced plan for a Red Sea bridge linking the Kingdom with Egypt could also help boost visitor numbers. With a market of 90 million Egyptians, the new pilgrimage route would help bring more tourists to Saudi than ever before. Video Can this prince make a post-oil Saudi Arabia?